In its 2010 ranking of the country’s best biking cities, Bicycling Magazine opened with a question: Remember when a striped bike lane was a big deal? Five years later, it’s time for an update. Remember when plastic posts were a big deal? We still love separating bike lanes with posts, and preference surveys show that most Americans do too. But this month, as we set about making our third annual list of the country’s best new bike lanes, we were overjoyed to realize that (with about 80 projects to choose from) almost every new lane on our list separated bike and auto traffic with some sort of permanent physical curb. “The things that we thought were really out there a few years ago are now accepted as part of our design palette,” said Jennifer Toole, president of the bikeway-focused Toole Design Group, in an interview Wednesday. The rise of curb-protected bike lanes has been dreamed of for decades in the United States, and in the leading cities, it’s finally arrived. 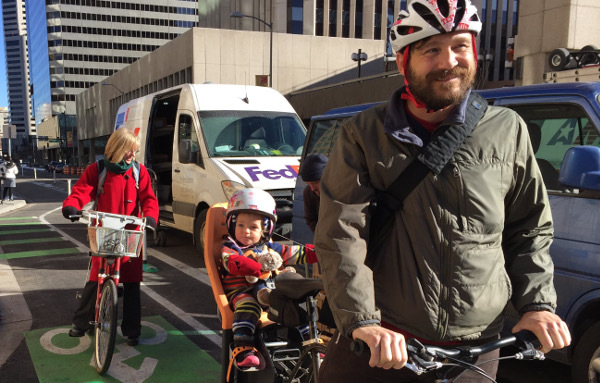 But the lessons we can all learn from the best new bike lanes of 2015 don’t end there. Let’s look at each in turn. American bike lanes hit a new standard of excellence in August in one of the country’s most underrated biking capitals. This beautiful half-mile project out of the heart of Boston’s next-door neighbor has it all: clear separation from both sidewalk and auto traffic; a direct route from a major commercial node and transit hub to a regional network of bike paths; bike signals at the intersections with leading intervals that give people biking and walking a head start to cross. A design like Western’s requires a street to be completely rebuilt, and most streets (including River, the other one-way street in this couplet) will wait a long time for something like this. But if every rebuilt street in the United States looked like Western, we’d be on our way to making biking so good that almost every American would choose to do it regularly. Kudos to Cambridge for facing down skepticism and showing the rest of us the way to do something totally right when we get the chance. 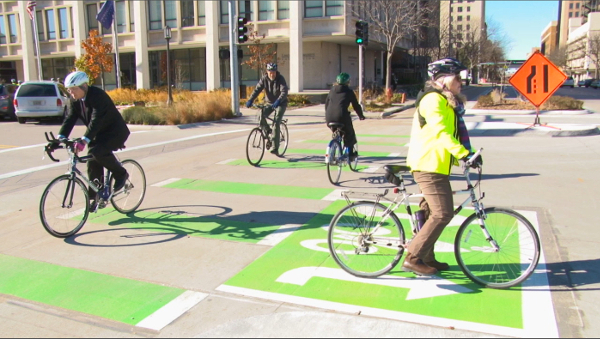 Of all this year’s advances in protected bike lanes, the most important is the protected intersection. One year after a homemade website gave this Dutch-inspired infrastructure an English name, Salt Lake City opened the country’s best so far. 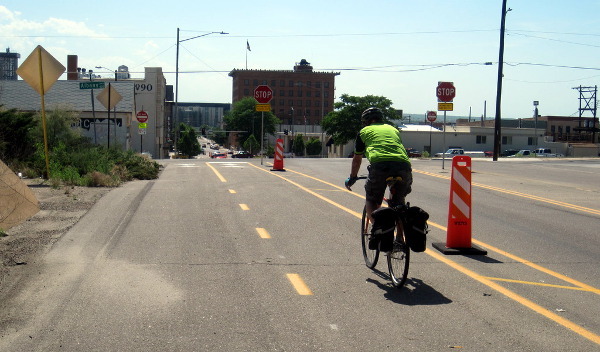 The new corner of 200 West and Broadway makes biking as intuitive as walking. It arrived alongside a big street upgrade that included street planters, better crosswalks and sidewalk art. Maybe that’s why retail sales rose 8.8 percent on Broadway after city leaders removed street parking and travel lanes to make these changes late last year. 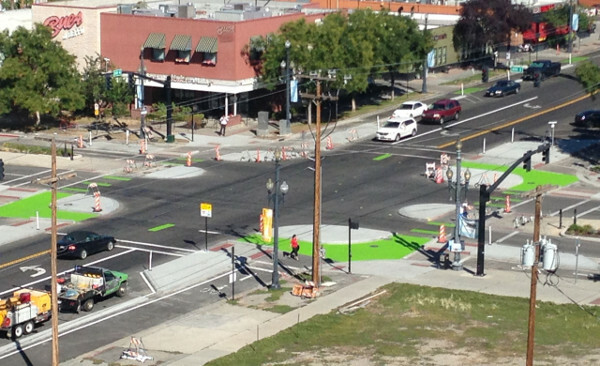 Now that the two streets are joined into a starter network, we’re eager to see SLC’s next trick. Queens Boulevard is the anti-Western Avenue: instead of two years of public meetings about something beautiful and permanent, these new protected bike lanes were part of a quick fix for a street in dire need of immediate help. If you ask us, that’s just as impressive. Between 1990 and this July, 185 people were killed and thousands were wounded by traffic on the so-called “Boulevard of Death.” The mother of one of them, Lizi Rahman, mounted a years-long campaign for bike lanes that was finally victorious in 2015. The city announced that Queens Boulevard would get changes in January, started planning the following week, released its plan in March and started work in July. “It might not bring my son back, but I would know that my son died for a good cause,” Rahman said at a 2008 rally. “I will do this for him and it will help save the other bikers in the future.” This was the year New York City listened, then acted. Next year, work on the permanent version begins. Also, if you know eastern Nebraska, you know it was basically put on God’s green earth to be biked on. Just saying. Seattle has the money, Pittsburgh has the gumption and Tucson has the heart. 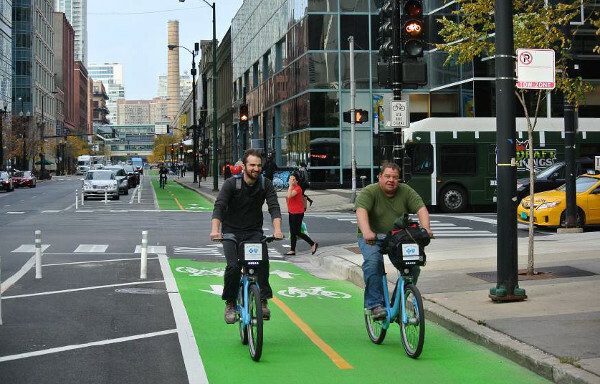 But when it comes to actually connecting protected bike lanes into a true network, no city in the country can beat Chicago. That’s only part of the appeal of Clybourn Avenue, which overcame a political feud to prove that Springfield and City Hall could team up for the greater good. Since 2013, when an allegedly drunken driver killed Bobby Cann while he was biking home from his job at Groupon, Illinois DOT has become a willing partner in creating the city’s second curb-protected bike lane. 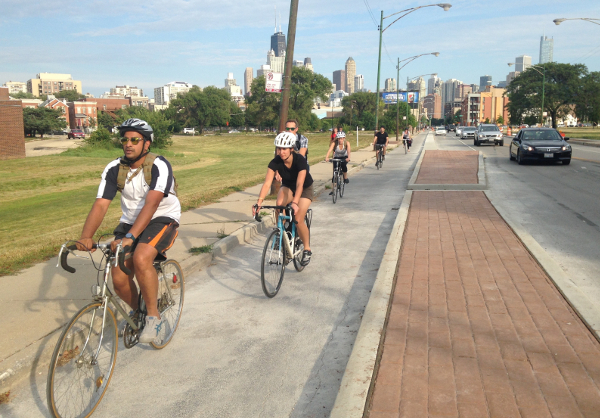 Though further intersection treatments would improve Clybourn, the street is a crucial link in the north-side biking network — which is why Cann was riding there. Today, thanks to the new curbs, hundreds of Chicagoans are doing so in comfort. 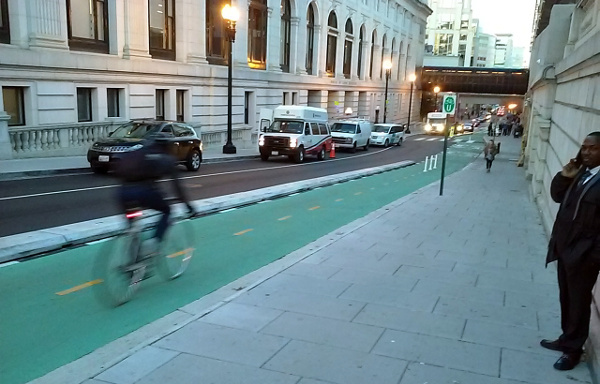 Last year’s list neglected these first curb-protected bike lanes in the nation’s capital, a physically beautiful connection from the massive transit hub at Union Station to the regional Metropolitan Branch Trail. Our concerns were its narrow width, nonexistent buffer and the fact that it’s a bidirectional bike lane on a two-way street, a combo we rarely like to encourage. The short extension that followed this year, offering better access to Union Station and the promise of a link all the way south to Pennsylvania Avenue, shares none of those shortcomings. So let’s celebrate the full length … and start rooting for phase three. If only these plastic posts could talk. This one-mile project was languishing as a line on a map until the Downtown Denver Partnership business advocacy group, inspired by a trip to Copenhagen and a wave of demand for better biking among downtown tech firms, rallied public support by creating a one-day demo and leading a successful crowfunding campaign that kicked off with an anchor donation from oil company Anadarko, among others. The $36,000 raised through Ioby.org convinced Denver leaders that the public had their back. With their green light, city staff threw themselves into Arapahoe and its couplet street with a passion, rethought their bidding process and cut the ribbon this month, less than a year after approval. Like Queens Boulevard, it’s a national model for quick-build street projects. Pueblo, population 108,249, hasn’t ridden the same economic rebound as Denver, which sits 115 miles to its north. “They are a rust belt type of community that is adapting to the modern economy with a new seven-block cycle track in their downtown,” said Carlos Hernandez, a consultant who worked on Fifth Street’s protected bike lane. For a bargain-basement $5,500 per block, Pueblo planned and built a downtown centerpiece for its new 20-mile network of buffered bike lanes, winning over a major business skeptic, nearly eliminating sidewalk biking and inspiring a monthly “taco tour” ride to restaurants along its length. “The Cedar Rapids, Iowas, of the world are going to see this example and say, gee, that’s more like us,” Hernandez said. Traffic is the curse of almost every beachside neighborhood, and low-stress bike access is almost always a useful treatment — not because it makes driving next to a popular beach more pleasant (nothing could) but because it actually gives people a viable alternative. 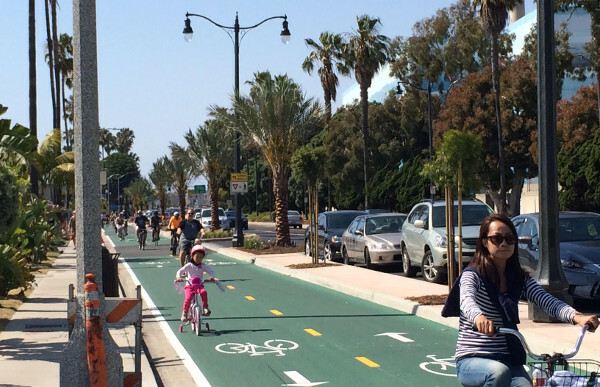 These gorgeous, busy new bike lanes, which serve crowds in the thousands on summer weekends, prove that this is as true in greater Los Angeles as anywhere else. Though Clinton Street lands our final slot because of its importance to the city’s connected network — which is poised to keep making exciting leaps in 2016 — this bidirectional post-protected bike lane with dedicated bike signal phases is remarkable for another reason: it’s almost exactly the same as nearby Dearborn Street, which was “the country’s most sophisticated downtown bikeway” when it justly earned our No. 1 spot in 2013. Two years later, a slightly improved version of that same design is enough to squeak in at No. 10. We can’t think of any better illustration of how fast the practice of U.S. bike infrastructure is improving right now. Whatever your philosophy of street design, that’s something to toast about as we head into the next year of great ideas.